Linda is an absolutely amazing cattery volunteer who’s been with Pixie for more than FIVE years. She comes at least one (but usually two) mornings a week, every week, to clean up after and care for all the kitties in the building. 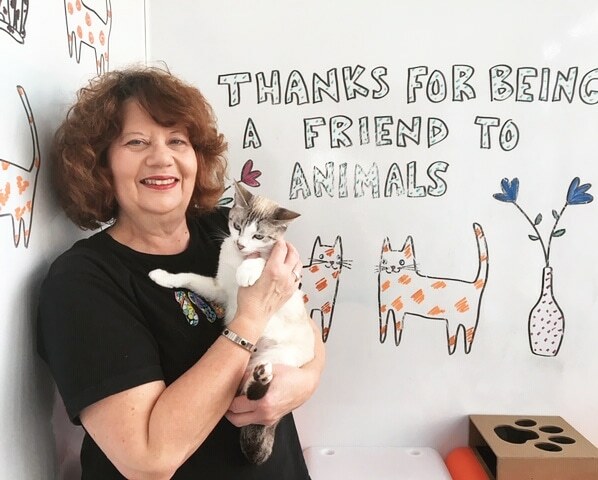 She has also fostered and adopted cats from us, uses her years of service industry experience to help us at our huge annual fundraiser, and is a wonderful, sweet person that lights up the shelter and makes everyone smile whenever she’s here! She’s an absolute doll with all of the cats and definitely provides a ton of comfort to each and every one. Last year, she was the recipient of our Cattery Award and she deserves to be recognized for her amazing work. Thank you, Linda!